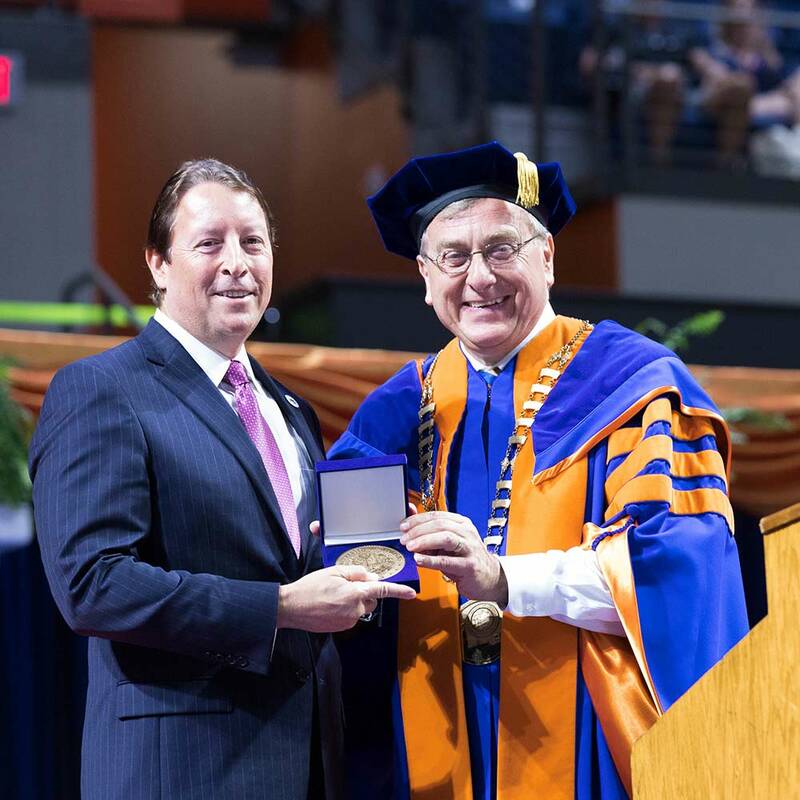 "As Florida grows as one of the nation’s most prominent states, and as families rightly demand the very best public universities for their children, I feel certain your leadership will prove historic," President Kent Fuchs told Florida Senate President-Designate Bill Galvano when he presented him the UF Preeminence Award at Convocation in August. Welcome, students! You have been carefully chosen, and we have been waiting for you to arrive. Families, loved ones and friends, I enjoyed meeting many of you as we helped you move in to residence halls on Friday. Each of these young people is dear to us. Thank you for entrusting them to us. So what basically is Convocation? Let’s pause to appreciate this moment and this tradition. Very simply, this is our way of welcoming you to your new university community. In this arena are individuals with whom you will share your hopes, your struggles and some of the best days of your life. Also with us today, or nearby on our campus, are those who will teach you … advise you … keep you safe … cook your meals … and keep the campus beautiful. We are all members of your new Gator family. Students, this convocation is also our ceremony to mark the beginning of your academic journey at UF. This is a journey of exploration and discovery at a university dedicated, at its core, to increasing human knowledge and seeking fundamental truths. Our exceptional professors are your guides in this journey, and they will insist that you inform, broaden and challenge yourselves. The mileposts for this intellectual journey are hours in the library, wrestling with difficult material and the incandescent joy of an insight or creative breakthrough. The mileposts for this journey are projects or presentations that you labor over deep into the night and finally perfect, and conversations with friends that seep into your soul. If you embrace this journey, you will add your voice to the respectful discussion and debate that animates the search for knowledge on this campus and worldwide. You will grow, change, and begin to contribute to this conversation and this exploration. I love how Dean White highlighted who you are as individuals in our 114th class. I would very much like to meet and learn about each of you, and I hope you will introduce yourself when you see me around campus. Email me at kent.fuchs@ufl.edu or reach out through Facebook, Instagram or Twitter. I tweet from @PresidentFuchs. My wife, Linda, and I will be at the shaving cream fight this Saturday at Yulee Pit. That will be your opportunity to spray the President and his wife with shaving cream! Parents: Linda and I live here on campus, so if you want us to check if your daughter or son really are studying in the library on Saturday night, just let me know. As you begin your time at UF, you follow in the footsteps of students who progressed from questioning and self-discovery to fabulous careers and fulfilling lives as scholars and scientists, authors, actors, business leaders … AND as lawmakers. In fact, our alumni include governors, senators, members of Congress and representatives. This morning, I have the honor of introducing as your keynote speaker one such leader in the public sphere. He is a Gator, an attorney and a champion of public higher education, Florida Senate President-Designate Bill Galvano. Senator Galvano served three terms in the Florida House before his election to the Senate in 2012 representing District 21, spanning Manatee and parts of Hillsborough County. He was Senate Republican Majority Leader from 2014 to 2016 and chaired the appropriations subcommittee on higher education this past session. Students, families, special guests, will you please join me in giving a huge Gator welcome to the next president of the Florida Senate, Senator Bill Galvano? Thank you for those wonderful remarks! Senator Galvano, as chair of the appropriations subcommittee on higher education, you continued your legacy as a champion of public education by sponsoring the landmark Excellence in Higher Education Act. This act greatly expanded the Florida Bright Futures scholarship program, benefitting thousands of academically accomplished students in Florida – including nearly all the students and families here this evening! The act also provided significant new resources for our state universities, including UF, to hire exceptional professors, to enhance our laboratories and facilities and to continue raising our excellence and stature. As Florida grows as one of the nation’s most prominent states, and as families rightly demand the very best public universities for their children, I feel certain your leadership will prove historic. In recognition of that leadership … with thanks for your service as a former chair of the Gator Legislative Caucus … and on behalf of UF and our students and families … I am honored and privileged to present you with one of UF’s highest awards … given on rare occasions to those who significantly advance preeminence at the University of Florida … the UF Preeminence Award.